The multi-talented Baugh was a two-time All-American at TCU, where he passed for 3439 yards and 39 touchdowns and was also an outstanding punter. While a baseball prospect as well, “Slingin’ Sammy” signed with the Redskins, newly relocated from Boston to Washington, who chose him in the first round of the 1937 NFL draft (sixth overall). A passing tailback in the single-wing offense, he improved as the season progressed and impressed with his poise as well as precision throwing ability. Redskins went 8-3 to finish first in the NFL Eastern Division. Won NFL Championship over Chicago Bears (28-21). Baugh went on to play 16 seasons in the NFL, all with the Redskins. Along the way, utilizing his sidearm passing motion to excellent effect he led the league in numerous statistical categories, including passing yards four times, touchdown passes twice, and overall passing on six occasions. Baugh also excelled on defense and as a punter and in 1943 led the NFL in passing, punting (45.9 avg. ), and interceptions (11). The Redskins benefited from his wide-open style and won five Eastern Division titles and two league championships in Baugh’s first nine seasons. After a difficult year of transition to the T-formation in 1944, Baugh came back to set a completion percentage record of 70.3 (that lasted until 1982) as the Redskins topped the Eastern Division, and he continued to excel even as the team went into decline thereafter, up until his retirement in 1952. Overall, he passed for 21,886 yards and 187 TDs with a 56.5 percent completion percentage on 1693 completions in 2995 attempts, all of which were NFL records at the time. Baugh, masterful at the art of the quick-kick, also set league records with a 51.4-yard average in 1940 and a career average of 45.1 yards, leading the league five times. On defense, he intercepted 31 passes. Baugh received first-team All-NFL recognition after seven seasons and second-team honors following two other years. 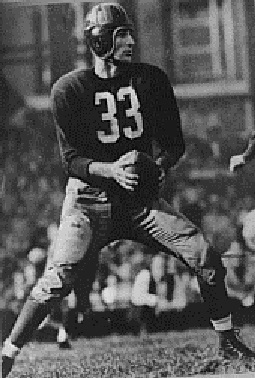 His #33 was retired by the Redskins (the only retired number thus far in franchise history) and he was inducted into the Pro Football Hall of Fame as a Charter Member in 1963. He went on to become a head coach in the AFL with the New York Titans and Houston Oilers.